Welcome to Gordon Cottage! 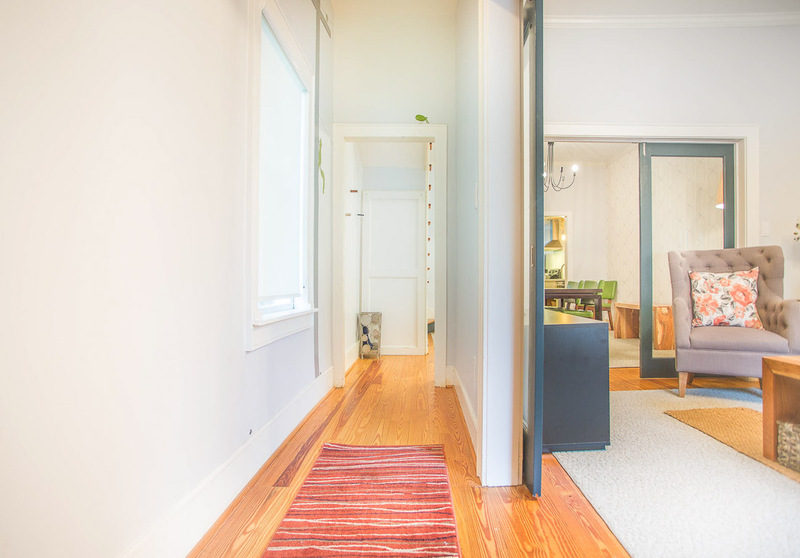 Walk in to your new Savannah digs. The living room is just off the main hall. View of the living room from the foyer. High ceilings and contemporary furnishings. The dining room is just off the living room. Cook a meal at home and dine in style. The dining table comfortably seats four. 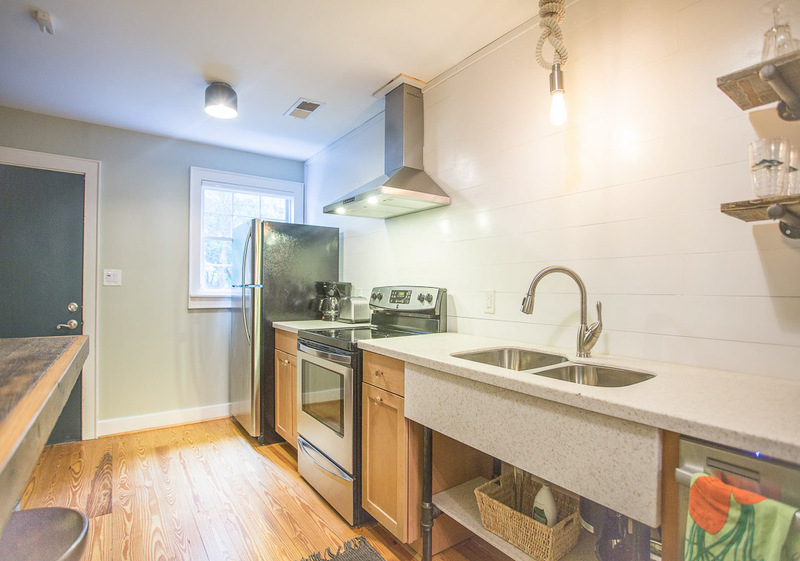 The kitchen is well equipped with stainless steel appliances. Have your morning coffee at the bar counter. View of the kitchen. The first bedroom has a King size bed. Check emails from the desktop. This bedroom gets great natural light. Watch TV from the bed. 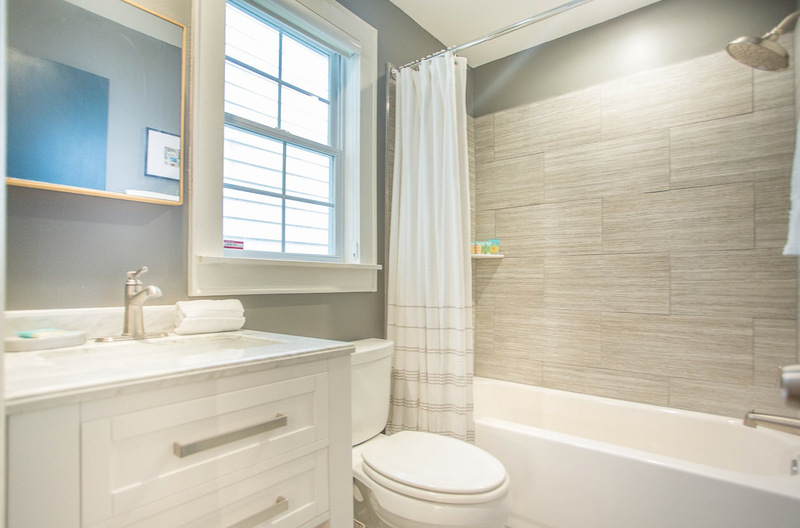 The recently renovated bathroom has a tub/shower combo. 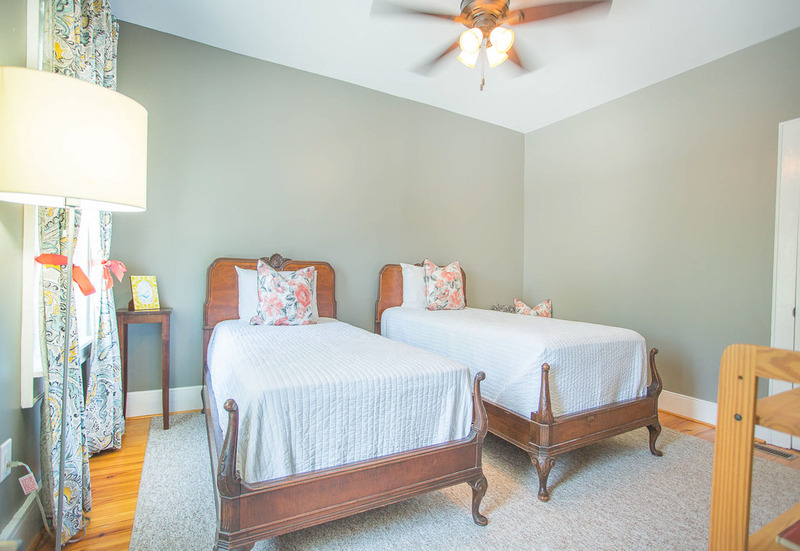 The second bedroom has a pair of twins - perfect for young families. 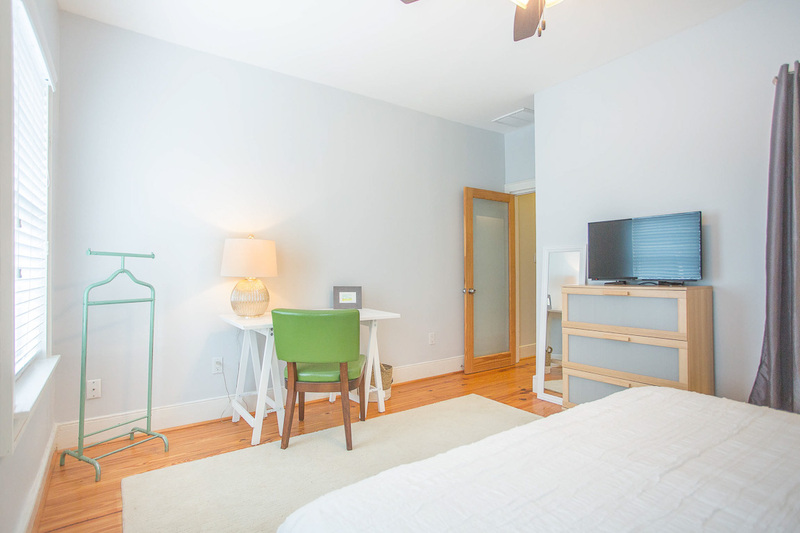 The second bedroom has ample floor space. View of the second bedroom. 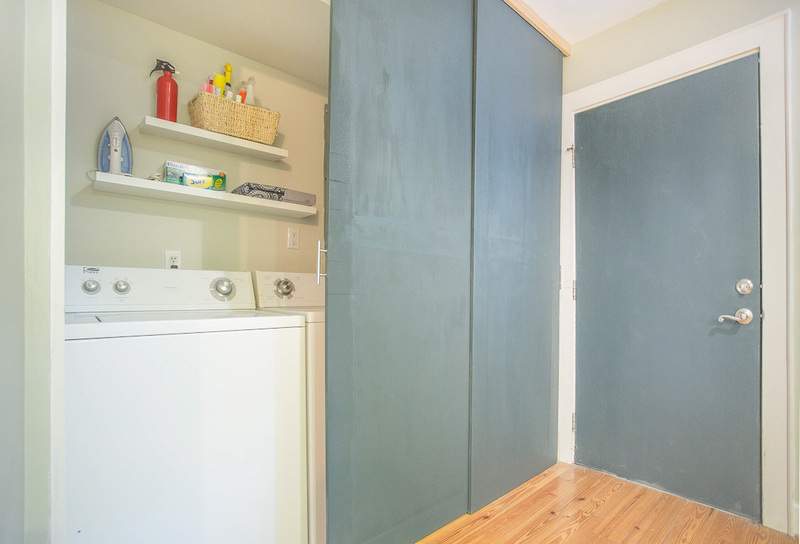 A washer/dryer is ideal for longer stays. Aerial view of the courtyard. The private courtyard is fit for lunch al fresco. 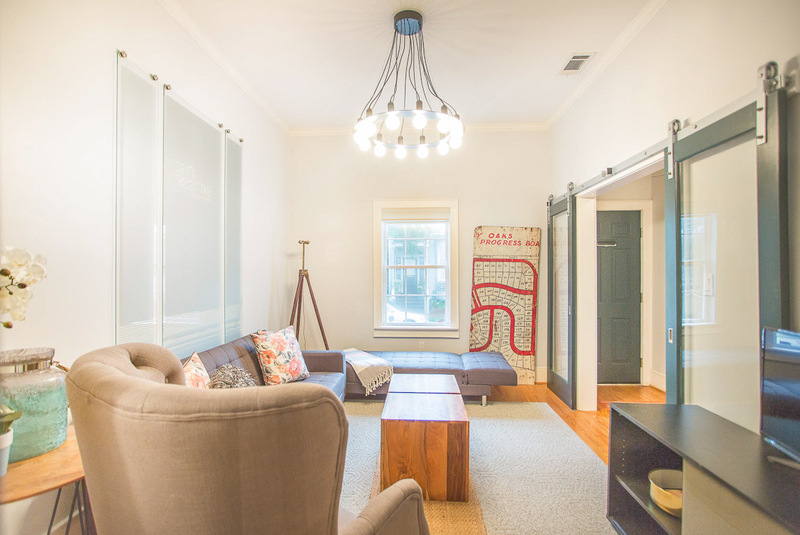 Stay in a charming Savannah townhome. View of the front entry. 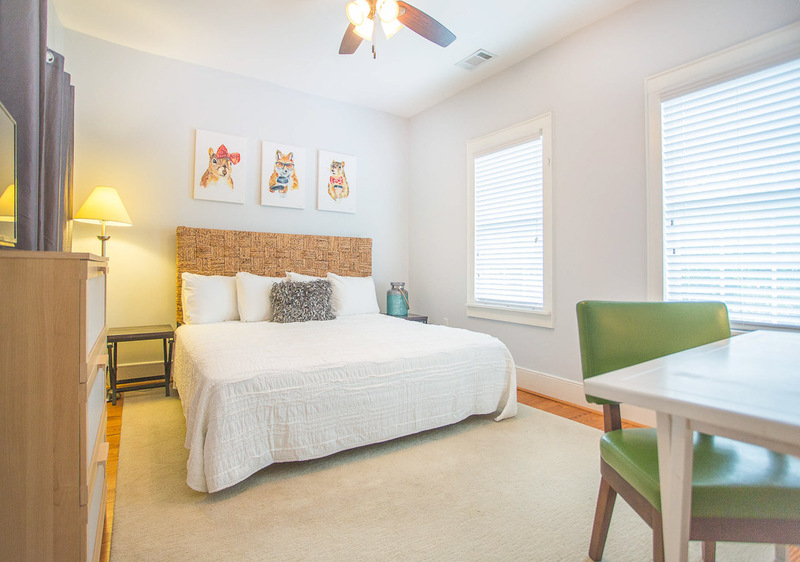 Located on East Gordon Street, this smartly renovated cottage is the perfect retreat for a couple or family looking to stay in style in the historic district. A private parking space is located directly behind the property, and there is plenty of non-metered parking in the front. 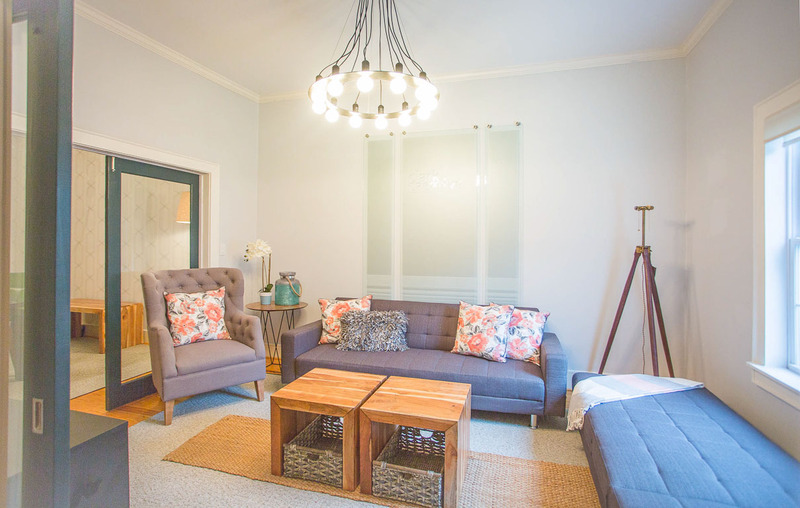 Gordon Cottage features a spacious living room with large, inviting sofas perfect for lounging. 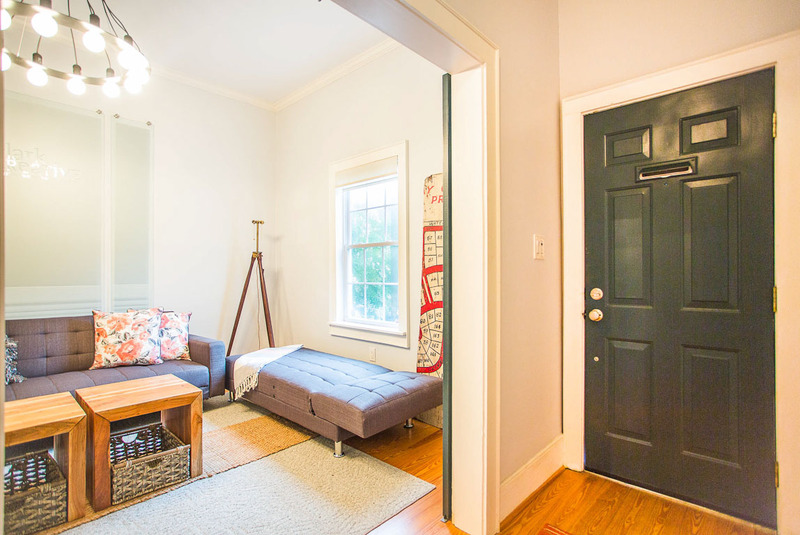 The adjoining dining room can comfortably sit four, and is conveniently connected both to the bathroom and kitchen. 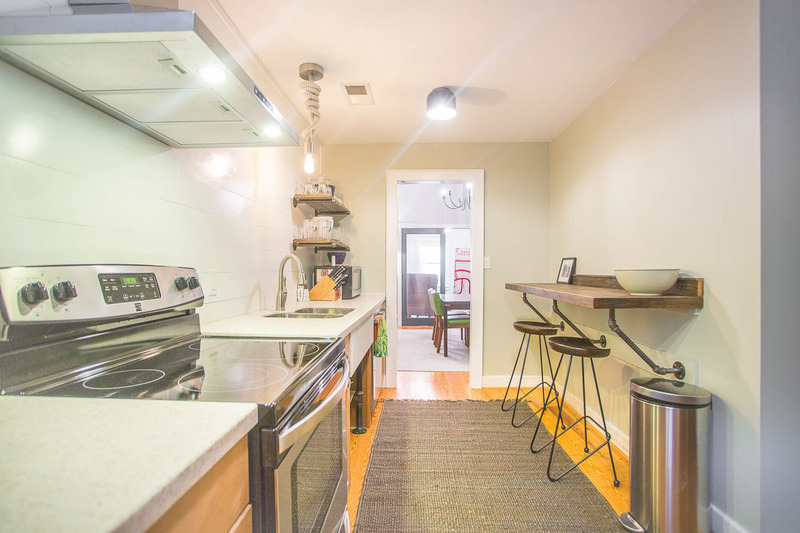 The kitchen has all the conveniences you could need, including plenty of counter space, a breakfast nook, and a washer and dryer tucked away in the back corner. 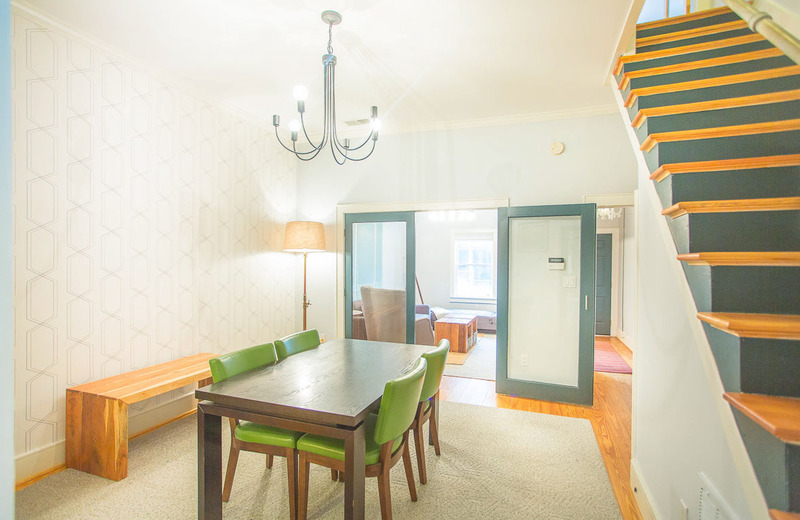 Up the stairs you’ll discover two large bedrooms. 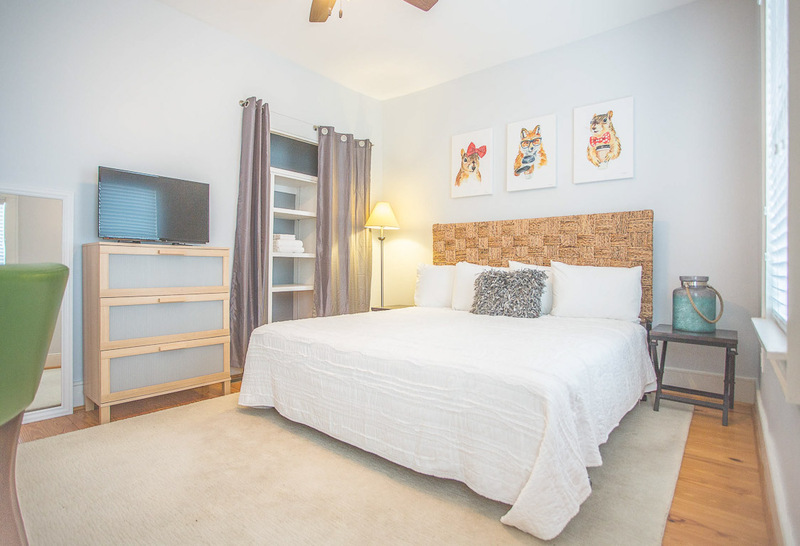 The master bedroom features a king size bed and flat screen television. 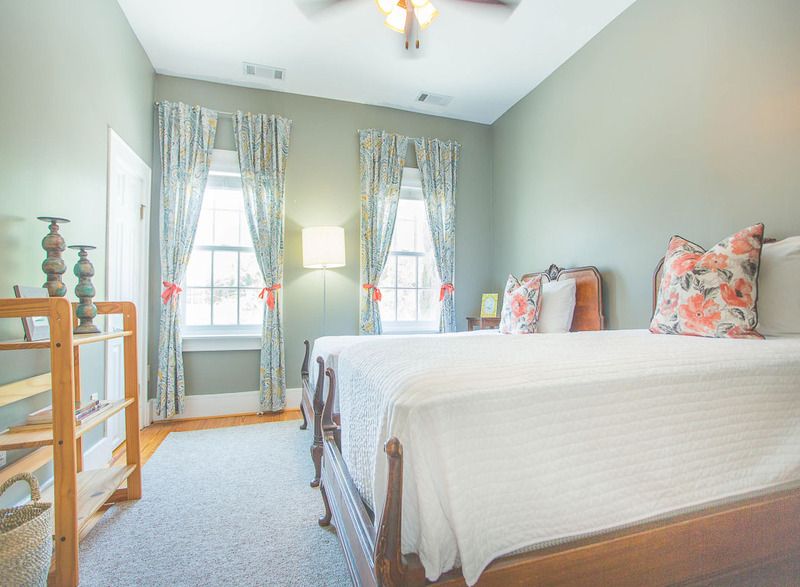 The second bedroom offers two, comfy twins, perfect for friends, family or kids! Making your way to the back of the home, you will locate the beautiful, serene, private courtyard. - Pick a direction and walk! In just ten minutes you’ll find yourself at River Street, Forsyth Park, and several other Savannah attractions! - The private courtyard in the back of the property has enough shade to be enjoyed in the summer. - The industrial modern decor is offset with lots of natural light and glass paneled doors. This charming cottage was the perfect place for a girls weekend. Super easy check-in, and the whole place was spotless. Nice updated bath, and I'm picky. And it turned out it was in a perfect location, so easy to walk everywhere we wanted to go!! Great management company - had a stupid question for them and they were super responsive right away. We enjoyed hanging out in the backyard for morning coffee and in the room shown for regrouping before heading out in the evening. Perfect! Overall the place was clean and had a great kitchen. My only feedback would be the front living room had a terrible smell. We tried Febreeze and it just kept coming back, it was so bad we would not even sit in there which was disappointing as that is the main sitting area in this rental. Next thing, for any future guests the stairs are extremely steep and slippery. DO NOT WEAR SOCKS TO WALK DOWN. Also due to the stairs I would say this unit is not small child friendly. Lastly, the bedrooms are upstairs and the bathroom is downstairs, so this can be aggravating having to go down the steep stairs every time you need to use or get to the bathroom. Morgan, thank you for staying with Lucky Savannah! We're so appreciative of this feedback so that we can better the experience for future tenants, and apologize if you felt your experience was anything less than great. We hope to host you again in other home soon! Overall trip was good. Park for people and dogs at the end of the street -- perfect. Location, within a mile of many sites and interests. Free parking fantastic, off street and unmetered on street. Be aware, single bath on ground floor and beds upstairs. Also, master bed in its last usable period. Hi Tim! Thank you for choosing Lucky Savannah! We're so glad you enjoyed the location of your rental. Also, thank you for bringing the bed to our attention. While beds are person specific, we will definitely check into this matter. We hope to see you again soon! The Gordon Cottage was beautiful, well furnished and very clean. It had a nice, private backyard. It was in a good, quiet neighborhood, close to what we needed. I had a few concerns. We arrived on Thursday afternoon. The television in the living room did not work. I sent two emails and called the service. I was on hold for 20 minutes and hung up. I sent text messages the next day and was assured the problem would be fixed. It wasn't. Every day I received promises and excuses. After 5 days, the evening before we left, I was told that they didn't guarantee that the cable would work anyway. Also, the bedrooms are upstairs and the only bathroom is downstairs. To get ready you have to cart everything down very steep, narrow stairs. The stairs are also an adventure when you want to use the bathroom in the middle of the night. You need to have mountain goat DNA. I would not recommend this place for older adults or young children. Finally, the kitchen had pots, pans and dishes, but nothing else. If you want to cook something, you have to supply everything or eat out, which we did. 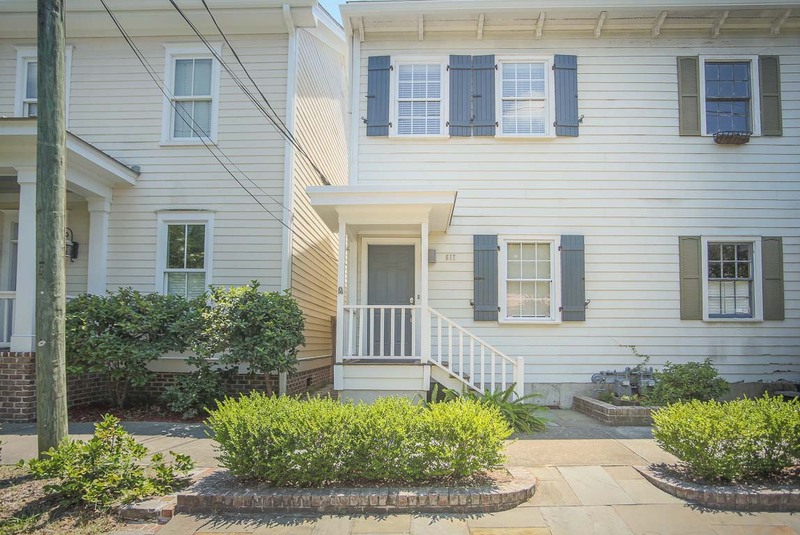 The good news, downtown Savannah is only 5 minutes away. Excellent location. Property was just perfect for my family. We had a very positive experience. We will rent from Lucky Savannah in the future. Hi Pamela! Thank you so much again for choosing to stay with us. We're so glad to hear you enjoyed Gordon Cottage and our beautiful city. Please know that you're privy to our Friends and Family discount next time you stay with us. Looking forward to hosting you again soon! Hi Nate! Thank you so much again for choosing to stay with us. We're so glad to hear you had a great experience at Gordon Cottage and will take your suggestions to heart. Please know that you're privy to our Friends and Family discount next time you stay with us. Looking forward to hosting you again soon! For several years, finally getting to go this week! And neat with a grocery store just down the street. Hi Paul! Thanks for staying at Gordon Cottage. We look forward to hosting you again soon! We stayed at the Gordon Cottage for three nights. It was clean and has all the comforts of home. The back patio was a great addition. We had coffee every morning and it was a great place to rest after walking all day. It was within walking distance of restaurants and meandering your way down to River Street. Hi AnnaMaria! So glad to hear that you felt at home at Gordon Cottage. We look forward to hosting you again soon. 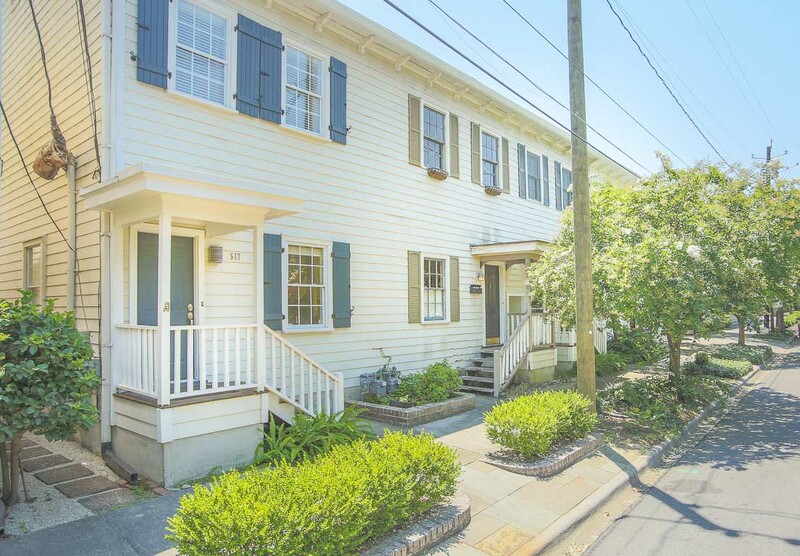 This is an amazing property and the location is really convenient to all of downtown Savannah. We will definitely stay here again. Hi Nicola! 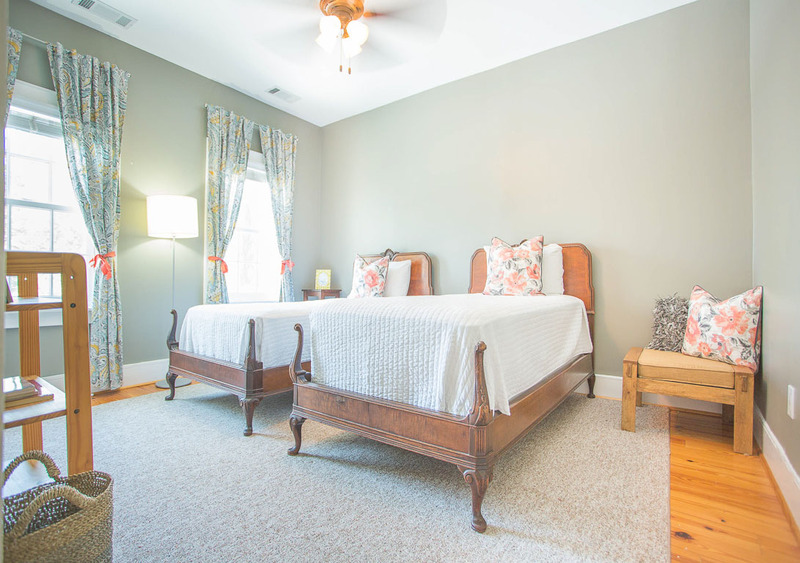 Thank you for choosing to stay at Gordon Cottage. We hope to host you again soon!